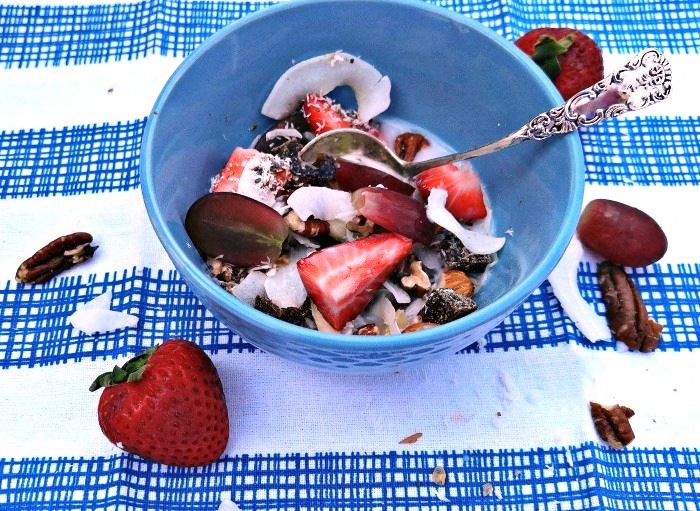 This grain free muesli is great for those busy mornings when you don’t have time to spend preparing a cooked breakfast. It has lots of proteins from the nuts and seeds, and is packed with healthy fats. What a great addition to your gluten free breakfast recipes! Traditionally, muesli is based on rolled oats. Since grain free one of my buzz words for the month, I had to come up with something that was tasty and convenient without the grains and sugar that normal comes in muesli and granola recipes. Breakfasts made in a bowl are very filling. Be sure to check out my Whole30 Apple and Coconut Breakfast bowl for another egg free breakfast idea. 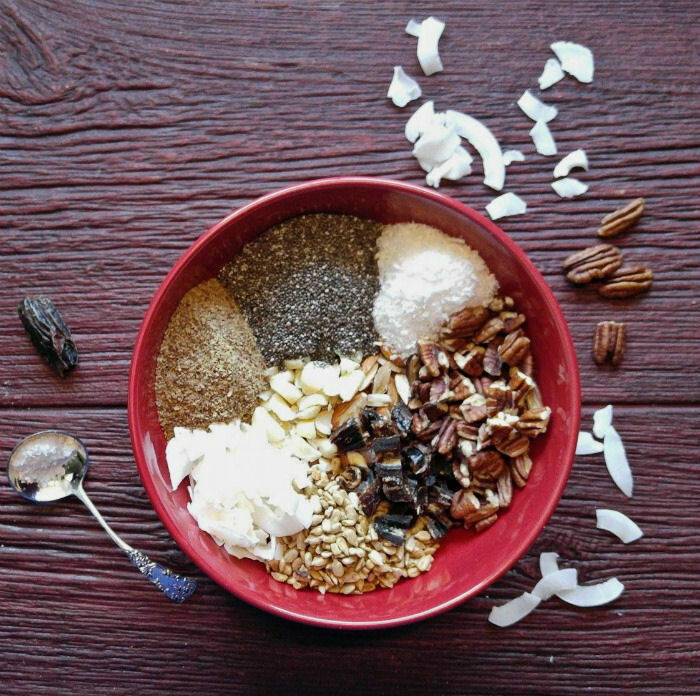 Let’s make some grain free muesli in just minutes! The sky is the limit for what you can use in this recipe. I used almonds, macadamia nuts and pecans, but if you like Brazil nuts, hazel nuts and walnuts, go for it. Just use the same amounts. There really is no right or wrong way to make a grain free muesli as long as you omit grains and sugar and substitute with nuts, seeds and dried fruit. 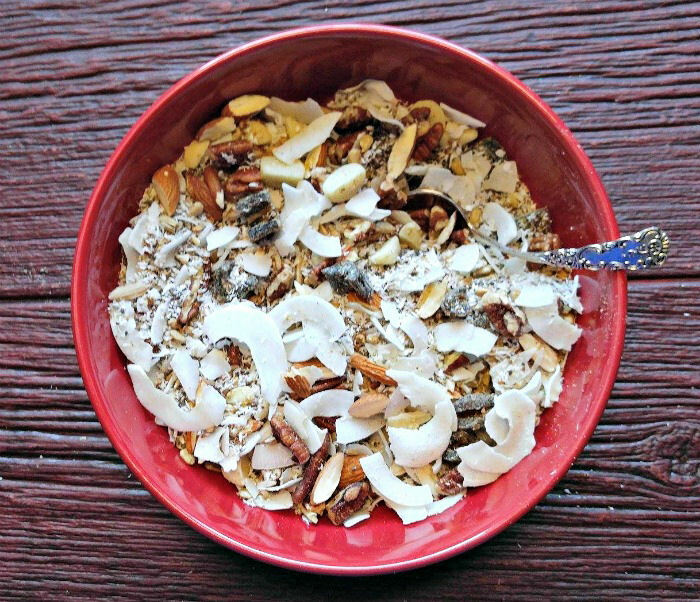 The muesli is super quick and easy to make. All you need to do is toss the ingredients into a big bowl, give them a good stir and your breakfast muesli is ready to go with plenty of extras to use on other busy mornings. This grain free muesli is free of added sugar and still has a sweetness that comes from the medjool dates. (my favorite new snack!) Ground flax seeds add a healthy dose of omega 3s as well as fiber, and help to make it easy on the stomach. Add fresh fruit for a bit of extra natural sweetness and add a splash of coconut milk, almond butter or coconut butter for some extra creaminess if you like your muesli moist. The breakfast muesli keeps well for up to a month. I store mine in a large mason jar. This recipe is Paleo, Gluten free, Whole30 compliant and Dairy Free for a healthy and tasty bowl of morning goodness. Combine all of the ingredients in a large bowl. Stir well to distribute all everything throughout the muesli. 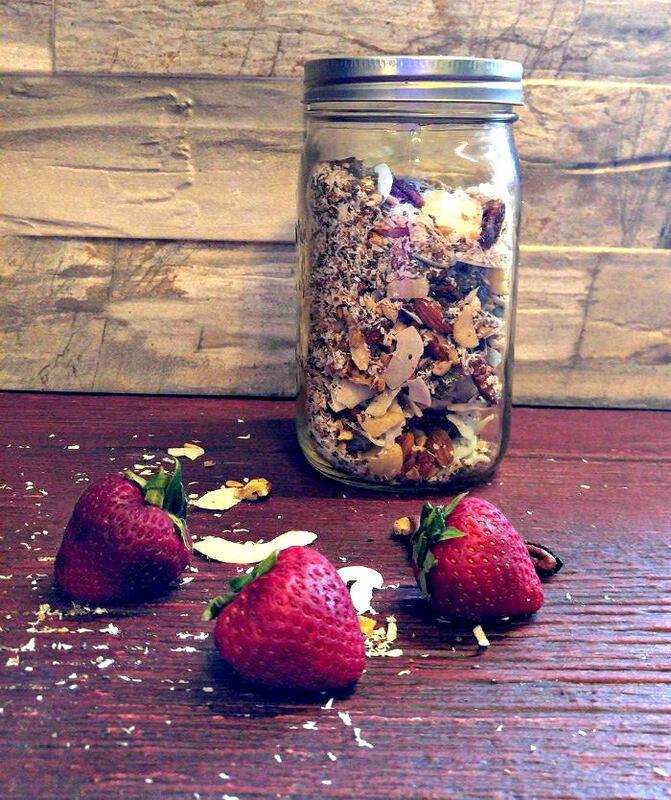 Place the muesli into a large 32 oz Mason jar. Store for up to a month. 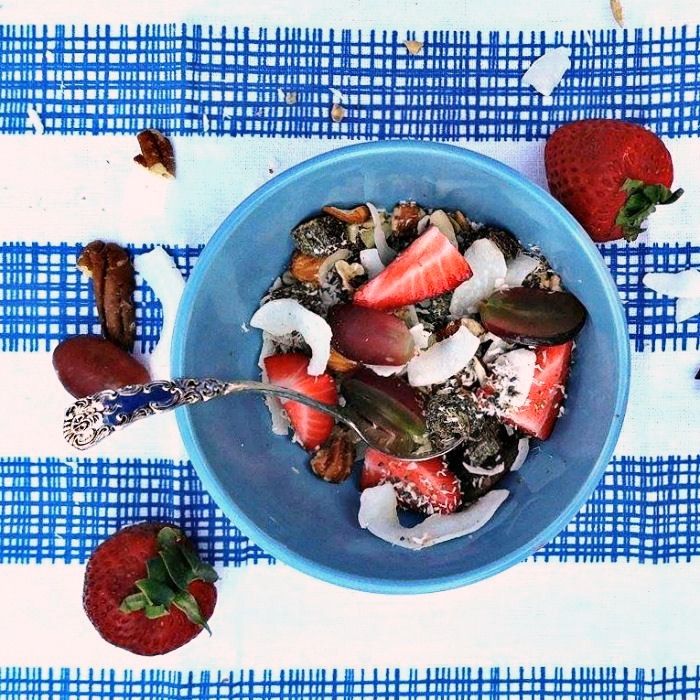 Enjoy the muesli with fresh fruit, almond butter, coconut butter or coconut milk. Makes 13 servings each about 1/3 cup.